Suchira's practice focuses on regulatory and patent issues unique to the pharmaceutical industry. 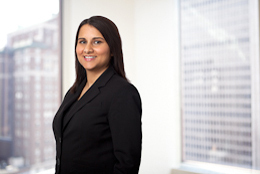 She provides counseling and litigation services relating to FDA and patent matters. Suchira has litigated disputes involving various marketing exclusivities arising under FDA authorities. She provides counseling services related to FDA matters, such as citizen petitions, REMS, abuse-deterrent drugs, biosimilars, user fee statutes, 505(b)(2) applications, marketing exclusivity, Orange Book issues, labeling, bioequivalence, patent notice letters, and approvals of drugs, biological products, HCT/Ps, medical devices and tobacco products. While in law school, Suchira interned in the FDA's Office of Policy, where she worked on issues of drug counterfeiting, pedigrees and track-and-trace. Prior to law school, she worked in the pharmaceutical industry as a process engineer with Schering-Plough Research Institute's Sterile Pharmaceutical Product Development group where she was responsible for developing and optimizing manufacturing processes for new drugs, including injectables, inhalers and lyophilized products from laboratory to commercial scale and technology transfer. Otsuka Pharmaceutical Co., Ltd. et al. v. Burwell, No: 15-00852GJH (D. Md. ): Successfully intervened on behalf of our client, Zydus Pharmaceuticals, on the side of FDA to oppose Otsuka's motion for a TRO seeking to prohibit FDA from granting approvals for generic versions of Abilify based on an interpretation of the BPCA statutory provisions governing label carve outs. Mylan Pharms., Inc., Watson Labs., Inc. and Lupin Pharms., Inc. v. FDA, Nos. 14-1522, 14-1529, 14-1593 (Fourth Circuit): Successfully reversed a district court decision and FDA's underlying administrative decision thereby allowing our client, Watson Laboratories (now Actavis) to share in a period of 180-day marketing exclusivity for a generic version of Celebrex. ViroPharma Inc. v. Hamburg, No. 12-cv-584 (D.D.C. ): Obtained a favorable decision for our client, Alvogen, Inc. at the preliminary injunction and summary judgment stages after intervening in an action against FDA by a competitor over generic versions of the antibiotic Vancocin. Roche Palo Alto LLC. v. Endo Pharmaceuticals Inc., No. 10-cv-00261-GMS (D. Del. ): Patent infringement dispute involving valganciclovir hydrochloride (Valcyte). Actavis Elizabeth LLC v. FDA, No. 09-362-RMC (D.D.C. ), No. 10-5066 (D.C. Circuit): Challenged FDA's new chemical entity exclusivity decision with respect to lisdexamfetamine dimesylate capsules (Vyvanse). Note, The R.F.I.D. Act of 2006 and E-Pedigree: Tackling the Problem of Counterfeit Drugs in the United States Wholesale Industry, 13 Mich. Telecomm. Tech. L. Rev. 577 (2007).